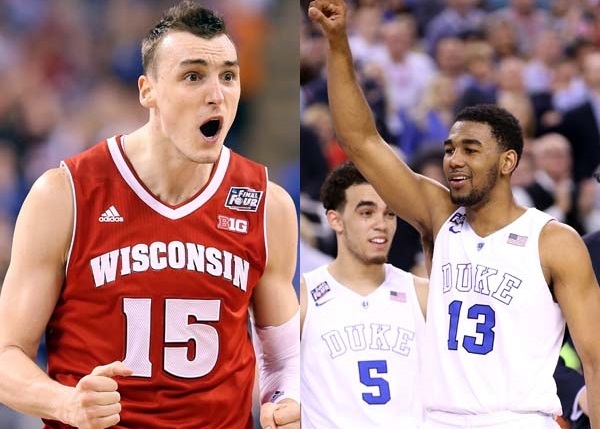 The championship match-up is set in Indianapolis, IN and it is rematch of an earlier season contest as the Wisconsin Badgers look to avenge the 80-70 home loss to the Duke Blue Devils back on December 3, 2014 and capture its first NCAA Men’s Basketball championship since 1941. The Blue Devils look to prove that they not only have the best player in college basketball but the best coach as well – despite what the post-season awards say, as they look to end the 2014-15 season cutting down the nets in Lucas Oil Stadium by winning their fifth national championship and second this decade. For the Badgers the road to Indy was full of potential obstacles and did not reflect a favorable draw for a team that was supposed to be the No. 2 overall seed in the Big Dance. After easily dispatching of Coastal Carolina 86-72 in its opening game, the Badgers were tested in each subsequent round. Whether it was staving off a comeback from a pesky Oregon Duck team, or having to overcome second half deficits against UNC and Arizona, Bo Ryan and his players showed that this year’s Wisconsin team had the grit and talent to be a legitimate championship contender. But even after possessing the confidence and the game film to show their winning pedigree, many college basketball fans outside of the program did not feel that the Badgers stood a chance against a Kentucky Wildcats team with undefeated destiny within its grasp. Early on Wisconsin showed the nation they weren’t ready to concede the berth in the Championship game to the Wildcats just because they were the best team in the nation and that the 38-0 record – while impressive – did not give Kentucky an extra ratings boost like it might in a video game. In the end a controversial no call on a shot-clock violation for the Badgers late in the second half and questionable offensive play calling down the stretch from Wildcat head coach John Calipari helped earn Wisconsin a date against another national powerhouse in Duke in tonight’s title game. Whether you hate or love the Blue Devils – and lately it seems to not be an in between – one has to admit that this could be of the most impressive Duke teams in recent history. Everyone knows about Jahlil Okafor but he has plenty of help with Tyus Jones, Justise Winslow and Quinn Cook contributing as well. The haters have tried to diminish the journey to Indianapolis by saying the Blue Devils region was easier compared to the other No. 1 seeds, but even if it appeared that way in the box scores, the Blue Devils did what good teams do – beat the teams you play convincingly. On its way to the championship game, only the Utah Utes were able to keep the losing deficit under 10 as the average margin of victory was 17.6. Despite the “Everyone over Duke” contingency hoping for an upset in the National Semi-final game against Michigan State, Tom Izzo revealed who his basketball kryptonite is his record against Coach K dropped to 1-9 as the Spartans were never really in the game at any point. It’s not often that a championship game is a rematch, so both teams should be familiar with each other. This time the Duke freshmen come into the contest more experienced and Wisconsin’s Sam Dekker won’t have the nagging ankle injury that limited him to five points and 24 minutes. Al: They are able to play balanced basketball and get clutch contributions from their role players. In the first game against Duke players not named Frank Kaminsky and Traevon Jackson combined to only score 28 points, but against the Kentucky those same players contributed 45 of the Badgers 71 points in the victory. Quinne: Wisconsin must keep the blue Devils off the foul line. The Badgers don’t foul often and because of the lack of depth up front beyond their starters, they can’t afford to. Pay attention to how the game is called early, if the refs swallow their whistles, it could bode well for Wisconsin. Quinne: Its co-stars outshine the Wisconsin’s. The Jones Boys, Tyus and Matt (no relation) have shown glimpses of star potential all season and with the Badgers looking to limit Okafor, Winslow and Cook, if either one can provide that “one shining moment” it could be too much for Wisconsin to overcome. 22 Million people tuned in to watch Wisconsin beat Kentucky and while it may not be that many eyes on what some would call a “less-than appealing championship game, it may be a more competitive match-up than what we would have gotten if Kentucky was facing Duke. The Blue Devil’s have the talent but Wisconsin has the experience and because of the early season 10 point loss now know how to defend Okafor better. In the end a healthy Dekker will prove to be too much as the junior forward brings his collegiate career to an end in style as the Most Outstanding Player of the Final Four.